Sometimes it seems there are roadblocks thrown in the way to keep a person from adopting. So it must have seemed to Amanda Balz of Pikesville, MD. She was denied adoption at one agency because she lived in an apartment at the time and when she tried to adopt a bully breed from another one, she found her apartment complex wouldn’t allow them. “I started to think I would never find the girl for me,” she says. 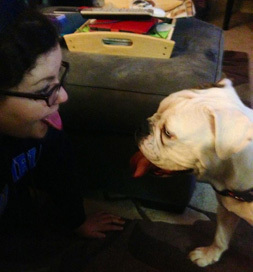 But then Bluebelle, an English Bulldog, popped up on Petfinder. She was at HeavenSent Bulldog Rescue in Turnersville, NJ. There was one complication: Bluebelle was deaf. How would that suit Amanda? As it turns out it was not a downside at all. She teaches deaf and hard-of-hearing students, so it was a perfect fit, she says. Sometimes the roadblocks just divert us to the right path.